90 MANAGEMENT QUOTES FROM THE WORLD'S BEST THINKERS - THE INTRIGUING, FAST, AND FOCUSED ROUTE TO SUCCESS. 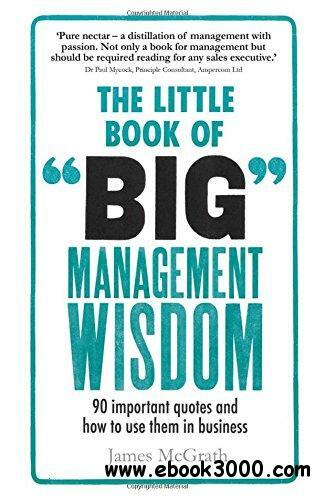 The Little Book of Big Management Wisdom outlines 90 of the greatest management quotations ever. The majority of quotes have been taken from legendary business leaders and commentators, including Warren Buffet and Peter Drucker. However, there are a few surprise inclusions from such people as Robert Frost and Elvis Presley. Each quotation, what it means, how to use it and the questions you should be asking, is outlined in two pages so you can immediately start to apply it in the real world. Packed with advice on how to deal with a wide range of management issues, this book will provide you with the insight and skills you require to succeed. All you want to know and how to apply it - in a nutshell.